Purchased from Maurice Segoura, 1980. This delicate oval-shaped table inlaid with charming marquetry depicting teapots, vessels, flower-filled vases and urns is characteristic of the work of the ébéniste Charles Topino. With his workshop on the rue Faubourg-Saint-Antoine, Topino specialized in small movable tables and much of his work in marquetry is of the type seen on this bonheur du jour, where the motifs have been inspired by the ornamental borders of Chinese coromandel lacquer screens. Although several other makers did produce furniture decorated with marquetry panels in this manner, this oval form of transitional bohneur du jour was favored by Topino and appears to have been exclusively produced by him. Furthermore, from his daybook which survives, it is known that Topino executed completed works and provided marquetry panels of this type for his colleagues the marchand-ébénistes. (See A. Pradère, Les Ébénistes Français de Louis XIV à la Revolution, Paris, 1989, p.319.) In light of this working arrangement, it is not unusual for this piece to be lacking a stamp by the maker and to instead bear a largely obliterated stamp probably belonging to the marchand-ébéniste who retailed it. 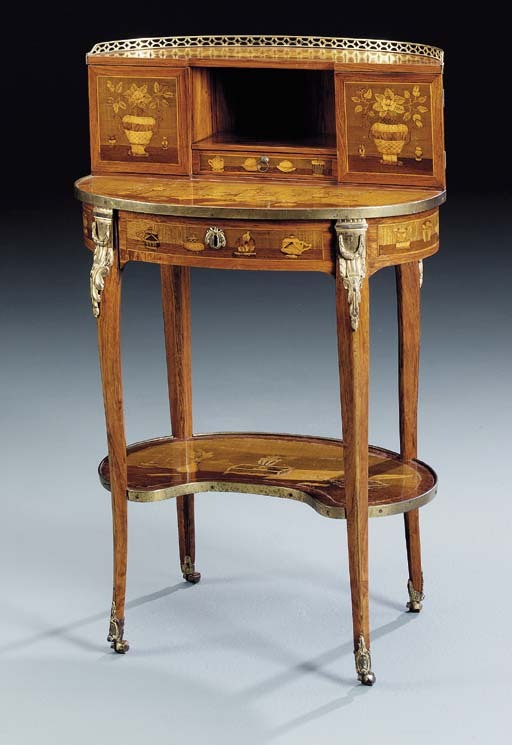 The bonheur du jour offered here is virtually identical to several published tables of this form stamped by Topino and also with nearly identical marquetry and mounts. Topino employed mounts provided by the fondeur Viret and chased by Chamboin and Dubuisson and gilt by Bécard, Gérard and Vallet. (Pradère, op.cit, p. 320). Although the mounts he employed were probably stock mounts, it is interesting that all the known tables of this form have virtually identical mounts. One such table is illustrated in P. Kjellberg, Le Mobilier Français du XVIIIe Siècle, Paris 1989, p. 842, pl. B, and a highly similar pair of bonheur du jour sold at Sotheby's London, 23 June 1985, lot 781. A related oval table by Topino but without a superstructure is in the collection of the Musée des Arts Décoratifs, Paris.